I love the Matchbox die - I just do! There are so many fun things to make with it and I wish that I had more time to play around with it. The weather has been beautiful the last couple of days and I've been spending every free moment outside working in the garden and playing with my kids. I did get a chance to put these little treat boxes together for my friends in a local MOPS (Mothers of Preschoolers) group. We had our end of the year celebration on Tuesday night and I brought these along to share. I got the idea for these lil' cuties from Shelli's blog. Shelli's boxes were much more elegant, but I was working under a time crunch, so I kept mine pretty simple. I also had a chance to use up some of my Delicate Dots dsp from Sale-A-Bration. Well, there are two more give-aways left for my blogoversary celebration. Tomorrow I will have a picture for you of the goodies I am giving away, but I'm going to keep it a secret until then...hee hee. :) Stop by tomorrow and leave a comment for a chance to win some free goodies! Very cute Jen:) Both of these items are on my wish list. 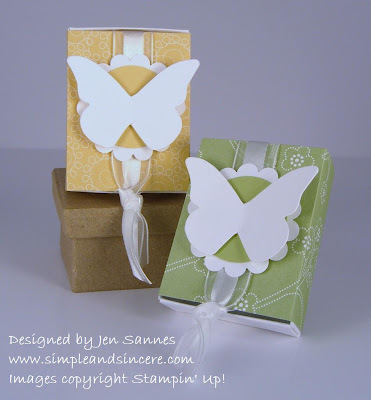 The matchbox die and the butterfly die. I'm planning to make wedding shower favors with the matchbox die. I love these! So elegant looking.